It is important to provide your dog with all of the essentials. A regular check-up each year at the local Anchor Animal Hospital in Dartmouth is a great way to start, treating everything from feline dental issues or bad breath in dogs to small pet illnesses or anxiety issues in dogs, your local Dartmouth vet hospital can help you keep your pets happy and healthy. You also need to make sure that your pets get the proper nutrition for their size, age and breed. While pet stores often have many choices, especially some of the large national chains, it is important to consult with your veterinarian to make sure you are feeding your pets the proper amount of calories and that they are getting the right nutrients. Plenty of fresh water and exercise are also important for the overall health of your pet. In this article we will talk about winter exercise tips for you and your dog. Even when you live in the New England states, it is important to provide your pet with lots of exercise. However, when snow and ice cover the ground in Southeastern Massachusetts, additional precautions and knowledge of potential pitfalls may be required. 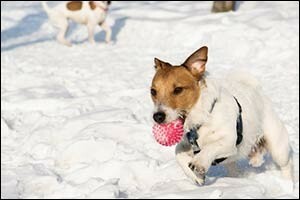 One way to exercise your pet when the weather is too cold and icy outdoors is to try some indoor games. Believe it or not, dogs love to play games like hide-and-seek with treats or toys. Some like to search by sight or by sound, while others prefer to sniff it out and find it with their nose. However you decide to play, these games are excellent for challenging your dog both mentally and physically. In fact, the leading reason why most dogs get into bad or destructive behavior problems is because they are bored or not challenged. Playing games like these can tire your pet out and give you both a good reason to get up and get moving each day, even in the dead of winter. It is a good idea to keep up with your walking routine, even in the winter. Consider indoor options, such as malls or shopping centers that allow dogs inside. Many people walk in the early morning hours before the malls are packed with shoppers – especially during the pre-holiday season. Treadmills can also be a good tool to use for both you and your pet. However, the good ones that are designed for use by dogs or that will stand up to years of regular use, can be quite pricey. Outdoor walking can also be done if you have a safe place to walk. See some more outdoor safety tips below for hints on how to make sure you protect your dog’s paws in the snow and ice. Dog Paws: In the Snow & Ice – Consider visiting your local veterinarian at the Dartmouth vet hospital to find out if your dog is healthy enough to play or exercise outdoors in the winter months. Senior dogs or dogs that have health issues, injuries or other concerns, may not be a good candidate for winter workouts in the snow and ice. While most big dogs love playing in the snow, every dog is an individual and will react differently to the winter weather. Allow your dog to play in the snow no more than 30 minutes at a time for a great daily workout, but make sure to supervise him or her at all times. If you salt your driveway or sidewalks, make sure to wash off your dog’s paws when you come in to prevent any injuries. Speak with your veterinarian for more safety tips for taking your pets outside in the cold, New England weather. Winter can be a great time to sign your dog up for a pet class. Local training centers, community centers, YMCAs and even big box pet stores offer a wide range of classes for pets. Indoor swimming, agility training, safety courses, good citizen classes and other options can be a great way for you and your pet to get in some exercise during the winter months. Not only will a class help keep you both fit, but it gives you and your dog something new to do together. This keeps the brain active, aids in socializing when other dogs are present and helps to increase muscle tone and agility all year long. Ask about certification options for good citizens and other type of training that could benefit you and your dog. If you live in the South Coast area, which includes Southeastern Massachusetts and Rhode Island, contact Anchor Animal Hospital in Dartmouth to set up an appointment for a well-check with your furry or feathered friend. Whether you need a solution for bad breath in dogs, cat behavioral issues, preventive vaccinations, nutrition advice or training options for anxiety issues in dogs, our Dartmouth vet hospital is here to help. Serving the local community for over 40 years, you can trust the highly trained and experienced staff at Anchor Animal Hospital to provide you and your pet with the very best of care. Give us a call today at 508-996-3731 to schedule an appointment or to learn more about our services.